Space… China (our first stop) has 1.3 BILLION people; Nepal (our 2nd) has 23 MILLION people (in a small space); India (3rd) has 1.1 BILLION people. Iceland? 300 THOUSAND – total, in the whole country. It is the size of England in size but only has 0.5% of their population. Following India, it feels like we are in outer space. Air… Iceland has some of the cleanest air on the planet. They even get a large portion of their energy from geothermal sources. My lungs have not been sure how to react. Temperature… Delhi was around 95 degrees F and humid. Iceland is about 40-something and dry. Water… finally, no hunting for clean water or worrying about getting Giardia from brushing your teeth. Iceland has some of the world’s best water, straight from the tap! Coca-Cola even sells a version of it in the states. Food… my body might reject it after our last 3 weeks, but in the last 24 hours we have had crazy exotic foods like, uh, vegetables, fish, fruit, milk, etc. If only I could get some blueberries I would be set. 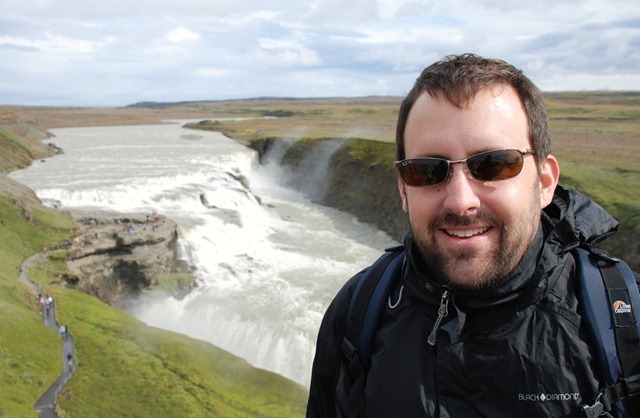 Before I get fully into Iceland, I will share a quick note on getting here. We left Delhi in the afternoon for a nice 9 hour flight to London, where we immediately gorged ourselves on these new foods (fish & chips, vegetables, and even a smoothie). We then hopped a late flight to Reykjavik and arrived at around 11pm. 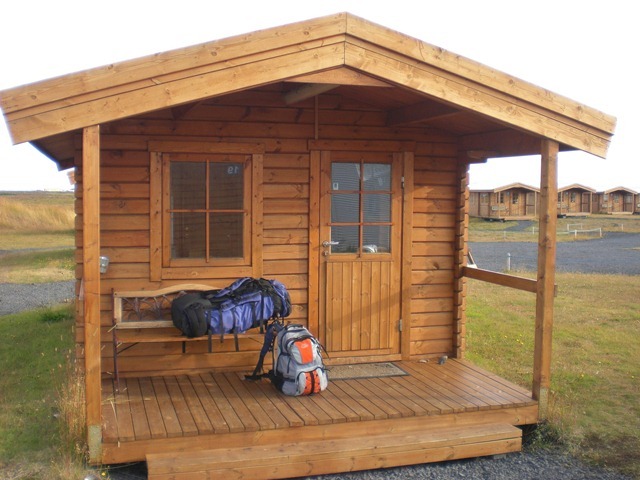 Luckily we had chosen a small complex of cabins right next to the airport. We were “exhausted” (said with dramatic effect just as Sonya would do it). We woke to a very windy and cold Iceland, which was great! Good to be out of the heat. After breakfast we caught the first airport shuttle, rented a car, and hit the road into the interior of the country. First order of business was to check off the Golden Circle, a series of interesting sights about 1.5 hours from the capital, Reykjavik. This included lunch in Sellfoss, then to the waterfalls at Gullfoss, followed by a series of geysers at a place aptly called Geysir. Last on the Golden Circle was the rift zone, where the N. American and European continents collide in a way that you can actually see them (not under the ocean). All of it was beautiful and then came the hard part. We needed to get up to the Snaefells Peninsula on the very west coast in a few hours. Sounds easy, but once started we realized that about 50% of the road getting there was unpaved. Our trusty Toyota Corolla handled it in style, as it’s bigger cousin the Land Cruiser had done in Tibet. Eventually we were back on paved roads and headed to the peninsula, where it became even more beautiful around every corner. Mountainous, but very green like Ireland. 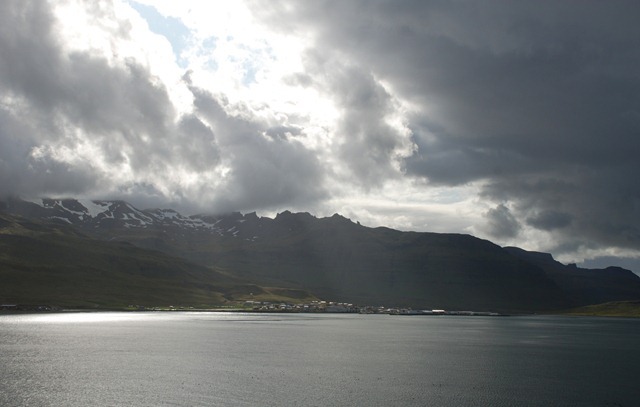 We arrived at the small fishing village of Grundarfjordur and the Framnes Hotel around 5:30pm. Oh, and I posted more pics in the photos section. Enjoy! That hut seems to have a better finish than your basement stairwell..